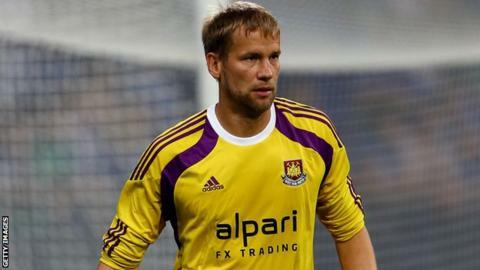 League One side Wigan have signed former Finland international goalkeeper Jussi Jaaskelainen on a free transfer. Jaaskelainen was released by West Ham in May having featured in 61 games for the club since joining in June 2012. The 40-year-old, who made over 500 appearances for Bolton prior to joining West Ham, has signed a one-year deal. "Jussi has had a tremendous career and was consistently one of the top keepers in the Premier League," Wigan manager Gary Caldwell told the club's website. "He is still in fantastic condition and as well as providing great competition in the squad, his experience will be invaluable on and off the park." Jaaskelainen won 56 caps for Finland before retiring from international football in 2010, having made his debut against Malta in 1998.